In conjunction with the South Coast and Los Angeles/Santa Monica Mountains chapters of the CNPS, we are offering a very special, new type of summer outing: a camping weekend in the San Gabriel Mountains. This will be open to CNPS members and plant lovers and their families associated with our local chapters, with a chance for all of us to relax together, go on some hikes and plant walks, have some activities for the kids, and really enjoy the flora and fauna of this magnificent place. 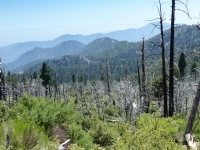 For more information on the San Gabriel Mountains, click here. Camping and Lodging: We plan on camping at the Crystal Lake Campground operated by the Angeles National Forest, which has plenty of camping sites. It is first come, first serve, so you may need to arrive early Friday to secure a spot. Some of us may try to save a couple of spots near each other if requested. The camp site fee per night is $12 and accommodates up to 8 people. Click here for more information about the campground. There are also a couple of cabins available from a private vendor, next to the campground; they need to be reserved ASAP. Click here for details. Food: Bring your own food. There is a small cafe with tasty food (but limited hours) if you choose not to cook. Activities: We are planning different levels of walks and hikes, and activities for children. Click here to download the current schedule of activities (updated July 19, 2018). If you are interested in coming, please RSVP by filling out this survey (click here). Some participants will arrive Friday evening of July 20 and stay until Sunday. Others may arrive later or leave earlier. Further information: Contact the organizers Cris Sarabia at csarabia@pvplc.org or Gabi McLean at gabi.mclean@verizon.net.